This year we decided to go for a family vacation on the third day of Syawal. 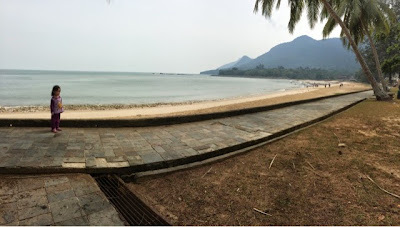 Our destination - Kuching's Damai Beach Resort. Located in Santubong which is 45mins away from Kuching town, the resort is famed for its serene beach view and fantastic natural environment surrounding the resort. We chose to go to this resort because our girls love playing in the water, and with the beach and swimming pool literally next to each other, the girls are sure to have a lovely time splashing in the water to their hearts' content! The resort has separate pools for the adults and kids. The kids' swimming pool comes complete with a water slide and waterfall. Love! I purposely booked the superior room which is the closest to the swimming pool. There is a big cage full of cats (local, not high breed though) behind our hotel building and frankly, the cats look bored with nothing much to do. When we reached the resort, I was expecting a well-established international standard resort because a lot of Western tourists happen to stay here. I was slightly disappointed to find the resort to be just average in terms of service and facilities. First of all, at the reception counter, instead of immediately greeting guest, the staff continued to do whatever he was doing and ignored me. So did the staff next to him. 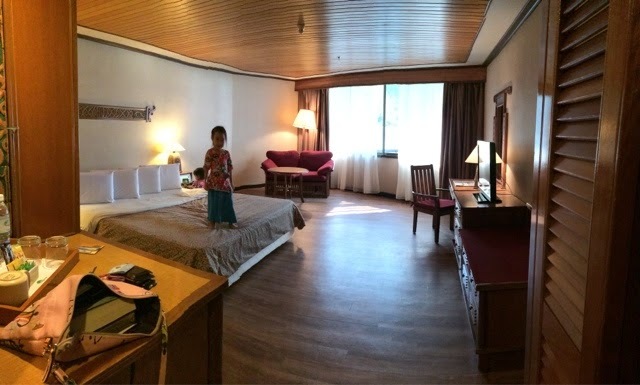 Where else, when I checked in at Westin in KL a couple of months back, the staff did not only greet me with cheerful but respectful tone, she also greeted my girls asking them their journey and practically wowing me with their wonderful hospitality. After waiting for 2 mins, finally the receptionist turned to me and proceeded to check us in. Our room was on the second floor and nearest to the staircase. The room is spacious (for a RM300++ rate, I would expect no less), but tired looking. Walking into the room made me feel like I've been transported to 2 decades ago. The amenities like the bed sheet, pillows, sofa, hair dryer and other fittings seem unchanged since the 90's. The only thing that looks new is the flat TV. The resort didn't even provide tooth brushes, but luckily we brought ours. 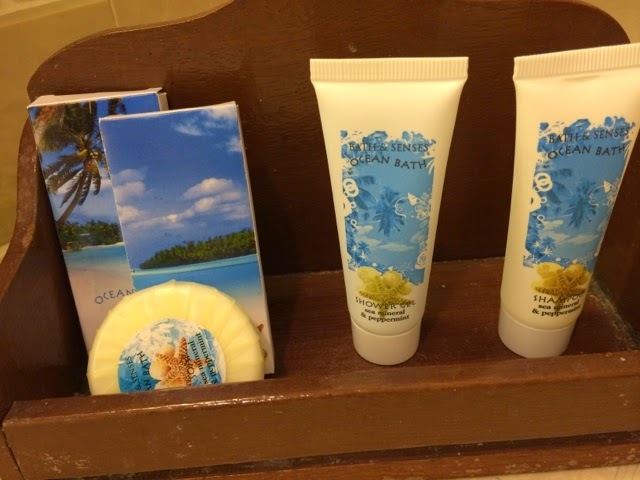 On the other side, I quite like the peppermint smell of the complimentary shower gel and shampoo. 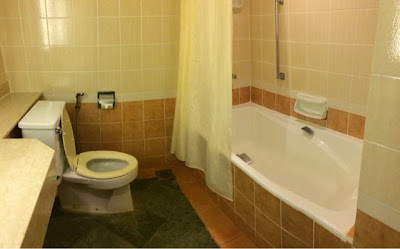 Much to our annoyance, the housekeeping team forgot to place towels in the room which we only discovered after coming back from the swimming pool. 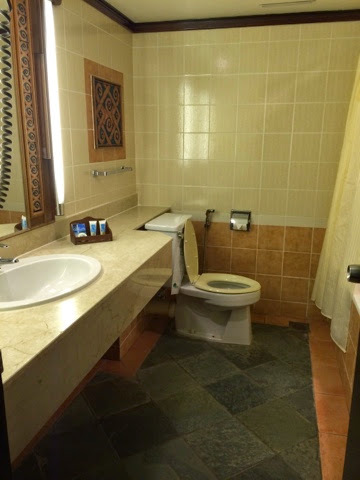 The telephone in the room was not working (the receptionist explained that due to earlier thunder, they switched off the telephone line), so hubby had to go to the counter to request for towels. We had to wait for half an hour (and another trip to the counter) before the towels arrive, and my girls were already so cold. Hmmph. Still, we are thankful for the cool room and having escape the scorching heat from the hot weather outside. The weather was quite good when we reached the hotel, slightly cloudy and breezy. Immediately we all changed to our swimming attire and hubby brought the kids swimming while I chill on a deck chair with a Sidney Sheldon novel. I even dozed off after a while because the sea breeze felt and smelt deliciously cool. Ah, lovely vacation! 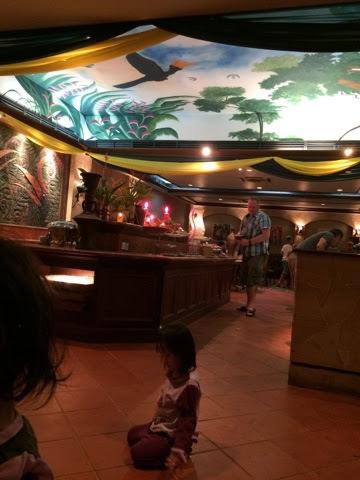 At night, we opted for buffet dinner at the resort's Satang Cafe (RM45++ per adult, kids below 12 eat for free). Sadly, the buffet was hardly appetizing and lacked choices. There was white rice, spaghetti carbonara with lumpy sauce, ayam masak merah, fish curry, mixed veggies in butter sauce, grilled lamb in blackpepper sauce, bun and butter, salad with few choices of dressing, and tomyam soup. Dessert was two types of layer cakes and some fruits. So I contented myself taking photo of the cafe interior. Fortunately the next day's breakfast (comes together in the room package) was better. Although there was no egg station (you only get fried egg to go with the usual baked beans, chicken frankfurt and whatnots), they offer nasi lemak, rice porridge with local Chinese condiments, an assortment of cereals, sliced cheese, an assortment of bread, croissant and buns to go with various jams and butter, waffle, roti canai, fried noodle and chicken curry. To my amusement, the resort put a notice that any unfinished food weighing more than 100g will be charged additional RM10. So peeps, don't waste your food here! 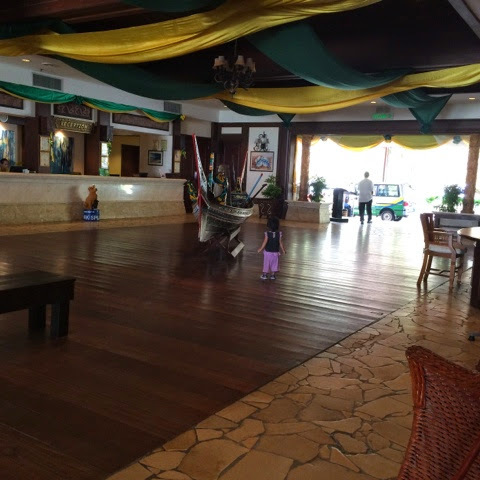 Overall, I think the resort management seriously need to buck up and upgrade the hotel services and facilities. Would I come here again? Maybe.